This home has everything you're looking for; location, space, upgrades and an amazing backyard with covered jacuzzi. 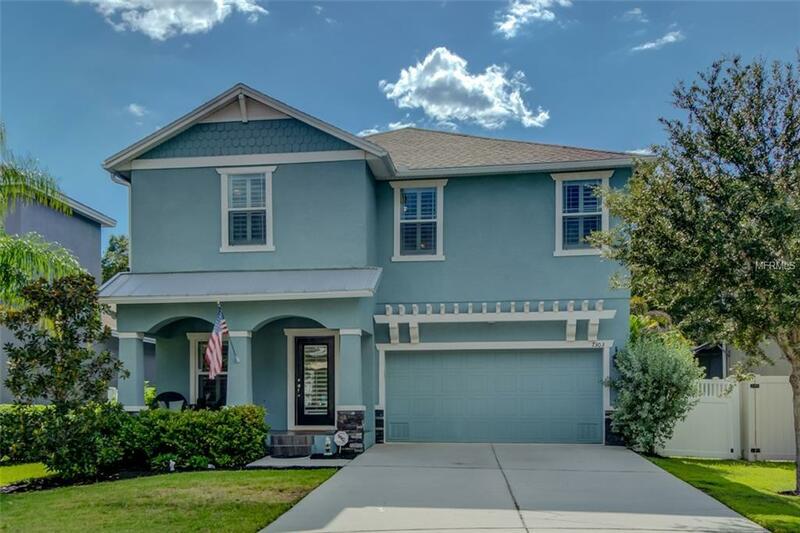 Located in a subdivision of similar homes with no HOA, minutes from MacDill AFB, on a dead end street, this 4 bedroom, 2.5 bath with huge loft home is what you've been searching for. Some features include decorative stone, wood tiled front porch, plantation shutters and wi-fi enabled garage door! The entrance leads to the formal dining room and open first floor with hardwood floors and tile in all wet areas. The upgraded kitchen features 42" espresso cabinets with rope molding and under cabinet lighting, antiqued white island, custom backsplash, SS appliances and granite counters. The kitchen opens to an eat in area and living space with upgraded dimmable can lighting, in-ceiling rear surround speakers, in-wall cord hiders/added plugs for wall mount TV; as do the loft and master bedroom. The upstairs leads to an oversized loft with double doors to the master suite with double tray ceilings, a large walk in closet and master bathroom with separate soaking tub and walk in shower. Also conveniently upstairs is the laundry room and the three other bedrooms and additional guest bath. Both the front and backyard are fully irrigated. The backyard is the true star of this property- fully fenced with a fire pit, built in pergola with 1 year new spa and room for a pool. This energy efficient home features double paned windows, two A/C units, hurricane shutters and an in-wall pest defense system.